Most Hollywood stars and celebrities are known for one or two things that put them on the map, but few manage to have the creativity to continue to make themselves relevant throughout their entire careers. While Mark Mothersbaugh was never an A-list celebrity as the front man for the hybrid-rock band Devo, he’s found a way to stay socially and pop culturally relevant for over 30 years. Mothersbaugh believes it was his father that instilled that desire to consistently produce within him. Throughout the ‘70s and ‘80s, Mothersbaugh was the lead singer of Devo, a band known worldwide for their smash hit “Whip it” and their zany videos, films and concerts that spoke about the devolution of the human race. In the mid-eighties Mothersbaugh’s career began to change from performer to composer. Over the next decade he wrote the theme song for the uber popular Nickelodeon cartoon “Rugrats” and scored films such as “Bottle Rocket,” “Rushmore,” and “The Royal Tenenbaums” for Wes Anderson. He also continued to work in children’s animation, writing music for Pee Wee’s Playhouse, The New Super Mario World and Beekman’s World, among others. 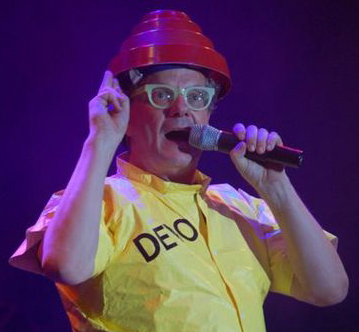 With the popularity of Devo beginning to wane at that time, Mothersbaugh had no intention of being a cult pop culture hero. Instead he found another way to create art. His pop culture status may be huge, but by all accounts, it could have been greater. Mothersbaugh actually turned down the role of Dr. Emmett Brown in Steven Speilberg’s “Back to the Future” in 1985, a part that cemented Christopher Lloyd’s career in Hollywood. Over the past decade, Mothersbaugh has continued to work with Anderson, as well as produce music for video games Jak and Daxter and Crash Bandicoot. However, over the past few years, in addition to scoring TV shows and feature films such as “Big Love” and “Cloudy with a Chance of Meatballs,” he’s found another outlet as the artist on the Nick Jr’s television series, Yo Gabba Gabba! called Mark’s Magic Pictures. While he doesn’t have an opportunity to talk about the devolution of the human race there, it’s been an opportunity he has cherished. As a result of his constant production of any type of art he can get his hands on, Mothersbaugh has always been in the public eye in one way or another. As a result, Devo has maintained enough popularity as well, making him a performer, composer and actor, as well as a husband and father, in his 60s.